Paul and I are both reading the (amazing) series A Song of Ice and Fire by George R.R. Martin. Mr. Martin frequently talks about the food the characters eat in details. One that seems to occur frequently is a rich stew served in hollowed out trenchers of yesterday’s bread. (Are you hungry yet? I am.) They also talk a lot about the fish stew. Being a lover of all seafood (at least everything I have tried.) I thought that the newly cool temperatures and an unexpected Friday at home were the perfect excuse to make a big pot of seafood stew. 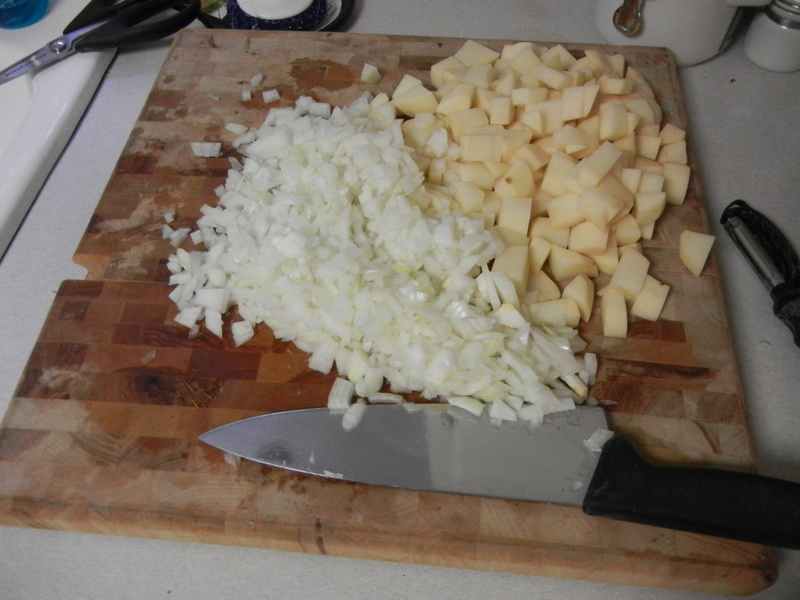 I did a little research on the recipe, looking at my usual go-tos, like my America’s Test Kitchen cookbooks, a soup specific cookbook I got Paul as a gift eons ago, http://www.allrecipes.com and the FoodNetwork website. 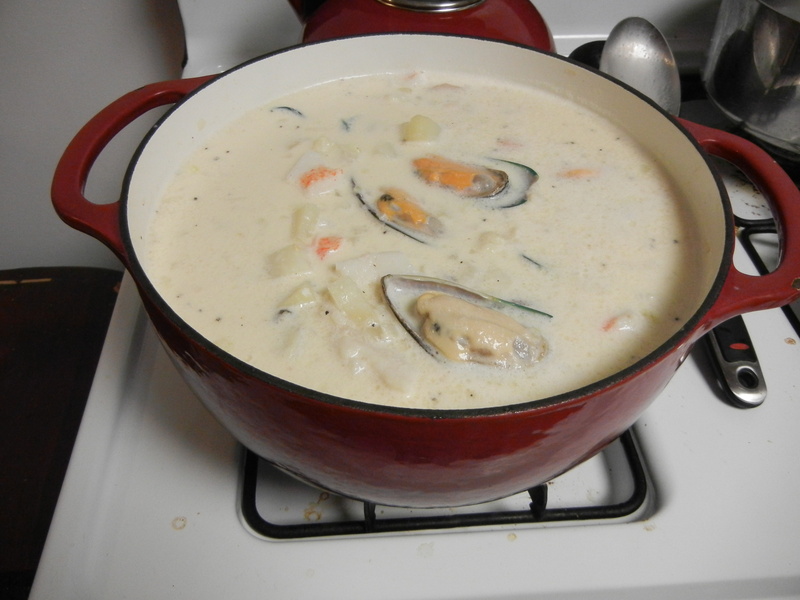 I went with the Thick Seafood Stew from Inn at the Crossroads, a website dedicated to creating the recipes for some of the foods mentioned in the books. They even have a cookbook out! We don’t have it, but someday we will, I don’t doubt. 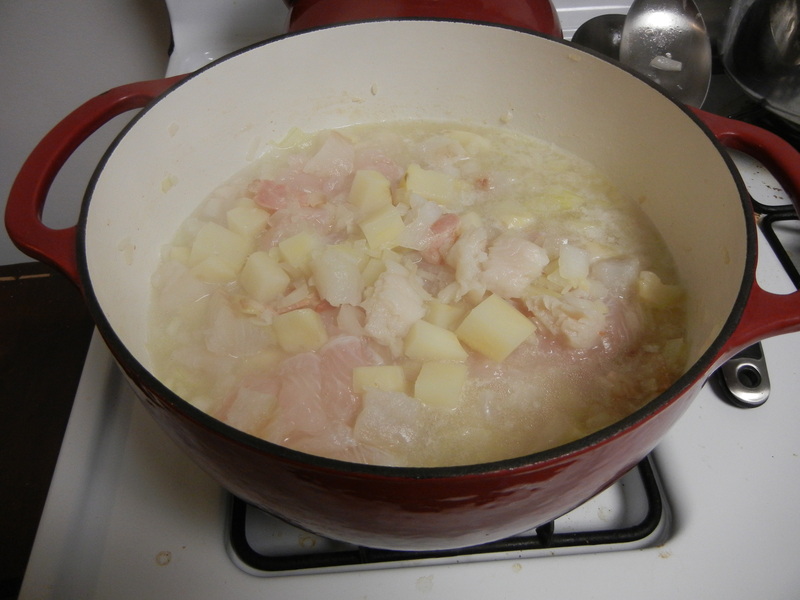 After the potatoes have cooked for about five minutes, you add the fish broth and the rest of your fish to the pot. I used cod and swai, which is a type of catfish. Let that “burble” (their word) for about 10 minutes, then you add cream, evaporated milk, salt and pepper, crab meat and whole mussels. I used imitation crab meat and frozen whole mussels, both of which worked quite well. I have cooked fresh mussels before and they are delicious, but it didn’t seem like it was worth the trip across town to get live mussels for a stew that would be simmering for much longer than is needed to cook live mussels. You simmer the whole pot for about an hour and then it is ready to enjoy! 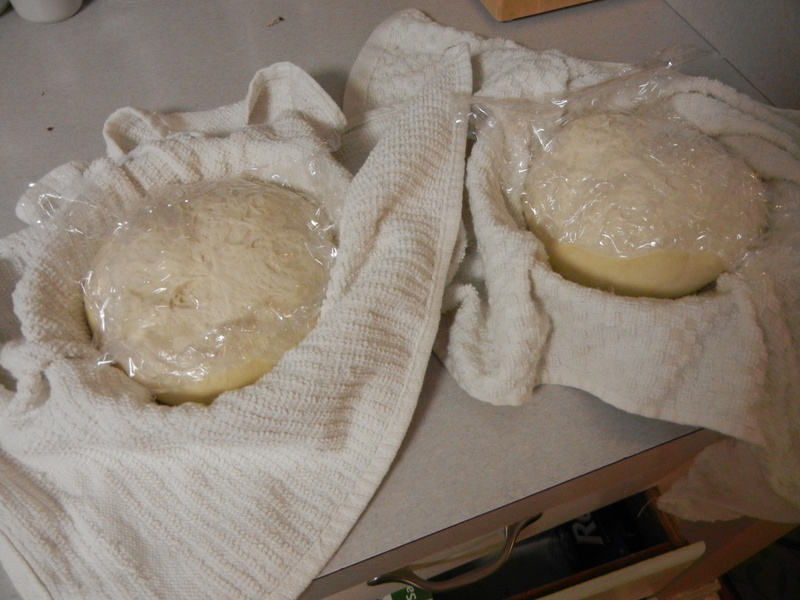 While it simmered we baked our bread bowls. 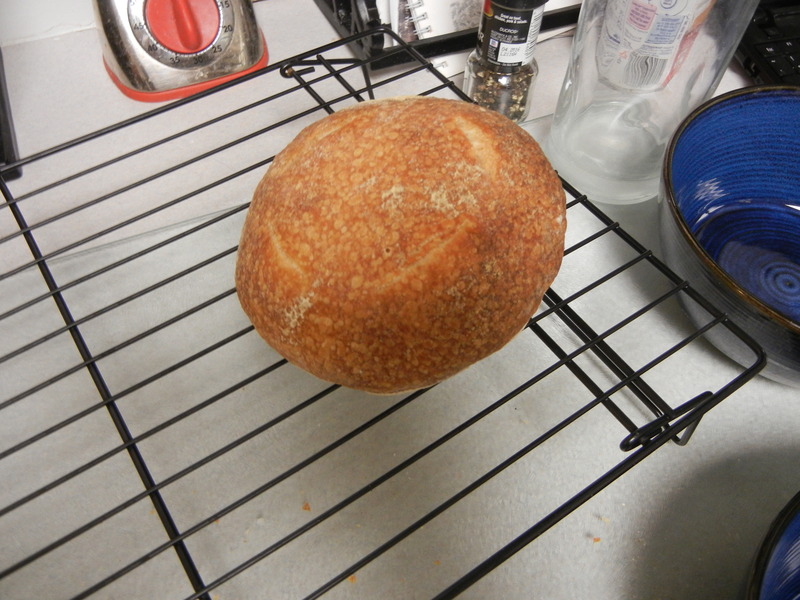 We used the Classic French Bread recipe from Peter Reinhart’s artisan breads every day, which is a fantastic book for someone who has no experience baking bread. 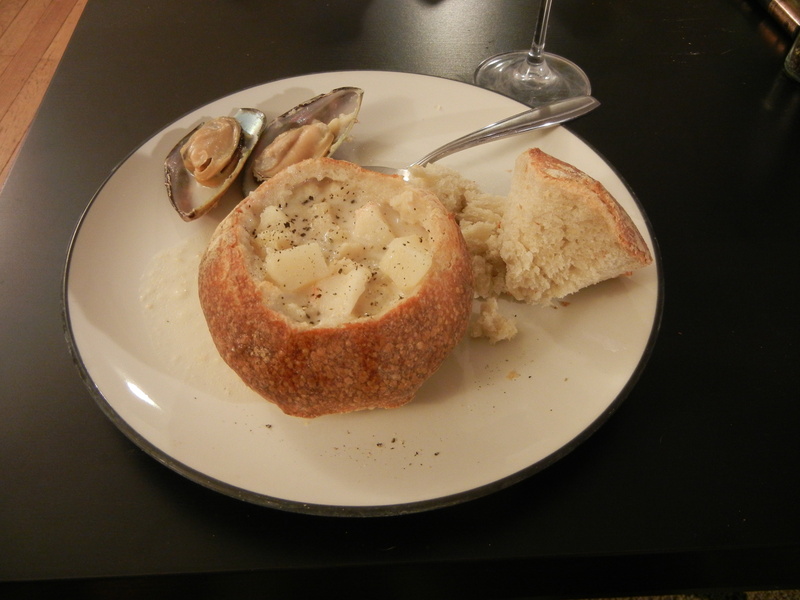 We served it in our bread bowls and garnished it with lots and lots of fresh cracked black pepper! Both recipes we used are delicious and I definitely recommend them!